It was a little bit of a drive, but the family all loaded in the van on Saturday and headed off to Raleigh on the promise of actual black walnut. 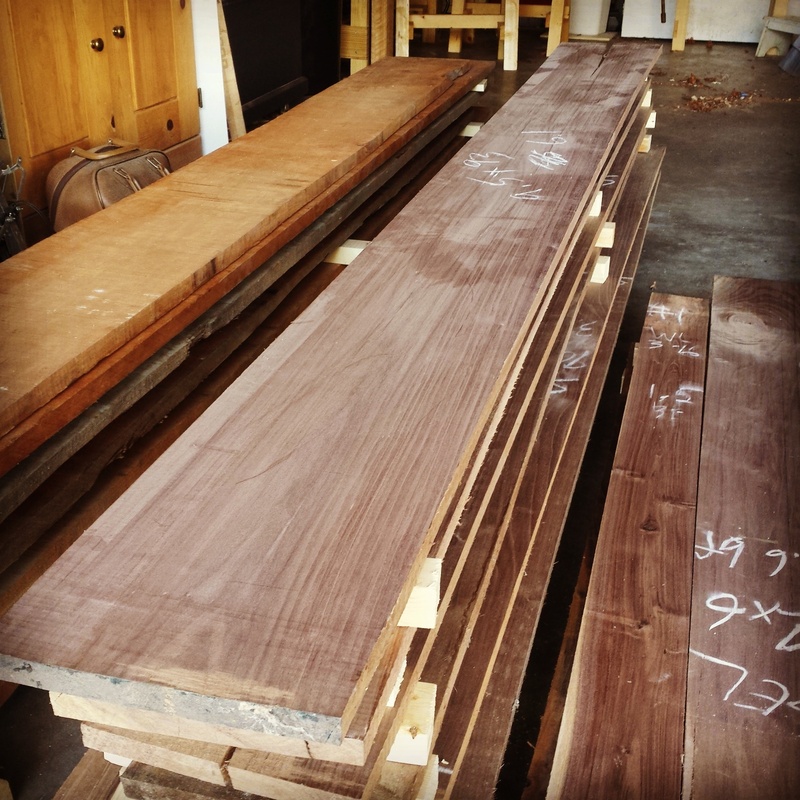 This time I had seen pictures of the machine surfaced wood and knew that not only was it actually black walnut, but beautiful as well. A few hours (and a stop for burgers and fries) later and the wood was stacked and stickered in my garage acclimating to the shop. The wood came from a gentleman who had spent a lifetime as a carpenter, cabinetmaker and career woodworker and was thinning out some of his considerable stock. When I asked him about his career he referred to it as a “calling” and that seemed just about right. He let me pick through one pile of stock until I had enough wood for the book case, and then on hearing that I was making a desk he invited me into his own workshop to select the top from some really beautiful wood he had saved out for his own work. I’m sure he thought I was a little crazy (and quite possibly naive) when I explained that I only work in hand tools at the moment, but I think he also understood we each have our own relationship to wood and that we spoke a common language none the less. I will be trying to finish up a few little things while letting the wood settle into the environment of the shop for a few weeks, but I’m really anxious to get started. This black walnut is really beautiful stuff. Next Post Like a kid at Christmas. Hopefully you did not drive through Virginia on your way to Raliegh to get the walnut as It can be found here locally, unless you are looking for re-claimed. No, we live in eastern North Carolina. Raleigh is only an hour and a half drive. My wife is from VA though and we’re up there frequently.